Sidney Bechet (1897-1959) was the first significant jazz horn soloist to be showcased on record, soloing throughout “Wild Cat Blues” and “Kansas City Man Blues” with Clarence Williams’ Blue Five on July 30, 1923. A clarinetist who made the soprano sax his main instrument, Bechet was a dominant player who, while mostly sticking to New Orleans jazz throughout his career, never ran out of fresh and exciting statements to create. A world traveler who first played in Europe in 1919, Bechet moved permanently to France after causing a sensation at the 1949 International Jazz Festival in Paris. During his final decade he was a national celebrity in France on a level that he had never reached in the U.S. While Bechet’s classic Victor/Bluebird recordings of 1932 and 1940-41 have been justly celebrated, his later French recordings are often overlooked. Four of his sets from 1949-51 (Favourites, Sidney Bechet-Claude Luther Et Son Orchetre Vols. 1 & 2, and Souvenirs) have been reissued on the two-CD set Sidney Bechet: Four Classic Albums. Joined by French players in ensembles led by clarinetist Claude Luter (along with appearances by American drummers Kenny Clarke and Wallace Bishop), Bechet is heard throughout in consistently exuberant form. While none of the French musicians other than Luter gained fame, their short solos are fine and they prove to be excellent ensemble players who gave Bechet the New Orleans flavor that he wanted. 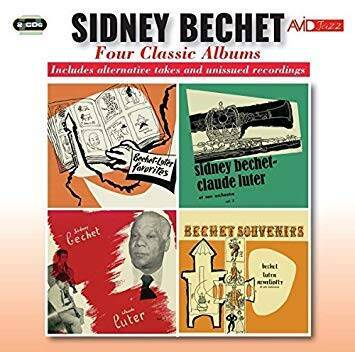 Whether jamming on his originals, blues, or Dixieland standards, Bechet generates a great deal of heat during this generous reissue which augments the four albums with four additional songs and eleven worthy alternate takes. Few could play “Royal Garden Blues,” “Maryland, My Maryland,” and even “Casey Jones” on as exciting a level as the great Sidney Bechet.